Introduced in OmniDB 2.6.0, the new OmniDB Console Tab provides an easy and comfortable way to interact with your databases. Users familiar with the psql command line utility will find that Console Tab behaves very similarly. 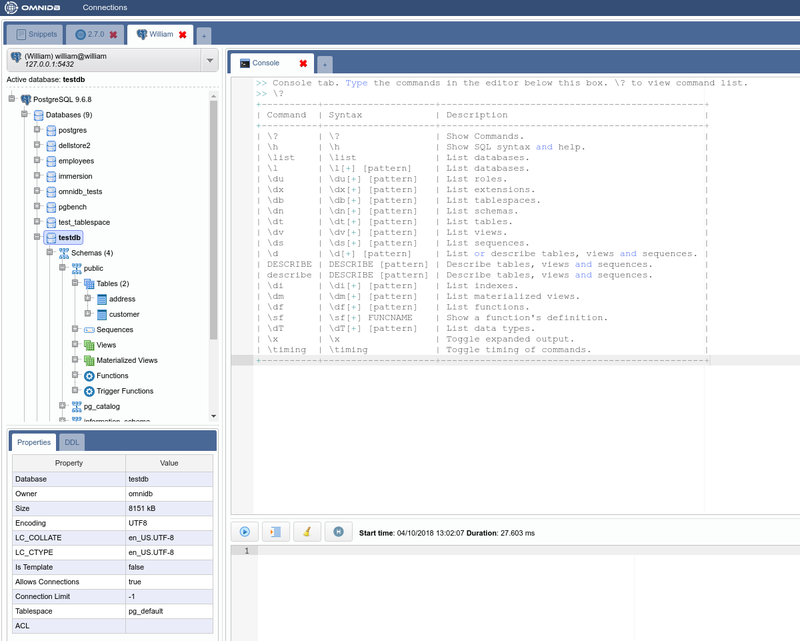 In fact, many of the backslash commands Console Tab provides are present in psql. For example, \? shows a list with all commands available, its syntax and description. 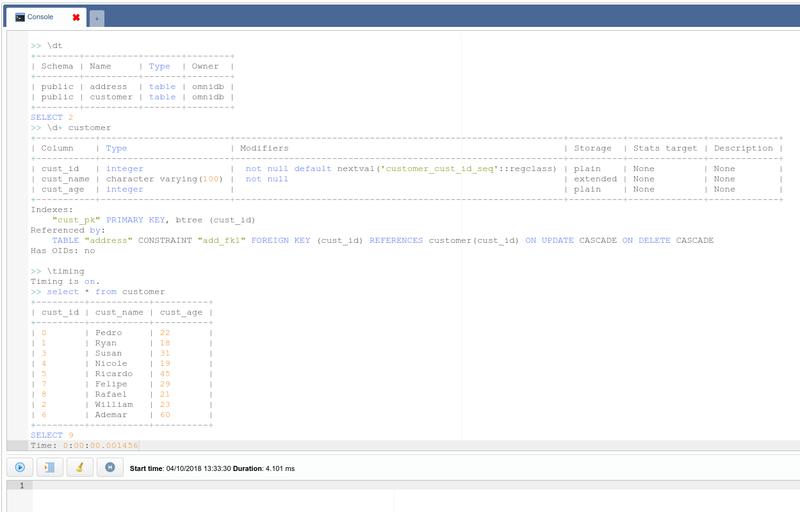 The command \h can be another friend of yours, because it shows a comprehensive help about any PostgreSQL SQL command. The editor on the bottom of the tab area is full-featured just like the Query Tab editor (it provides syntax highlight and autocomplete with Ctrl-Space). To execute a command, just type it in this editor. If the command is a backslash (starts with \), just type Enter and it will be executed. If it is a regular SQL command, then it can be multi-lined, and you will need to type Ctrl-Q to execute it. All commands and its output will be logged into the display area, which is textual and read-only, so you can copy and paste its contents somewhere else. You can clear the display area by clicking on the Clear Console button. 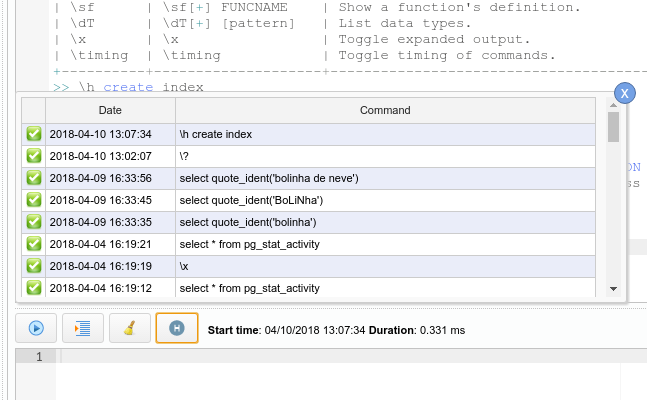 All commands also are logged in the global OmniDB query history, and also in a local console history, which you can by clicking in the Command History button. By clicking in the green check, you can borrow the command and put it into the editor, so you can amend it and execute it. Another comfortable way to navigate through the history is using the shortcuts Ctrl-Up and Ctrl-Down, to quickly paste in the editor the previous and next commands, respectively. 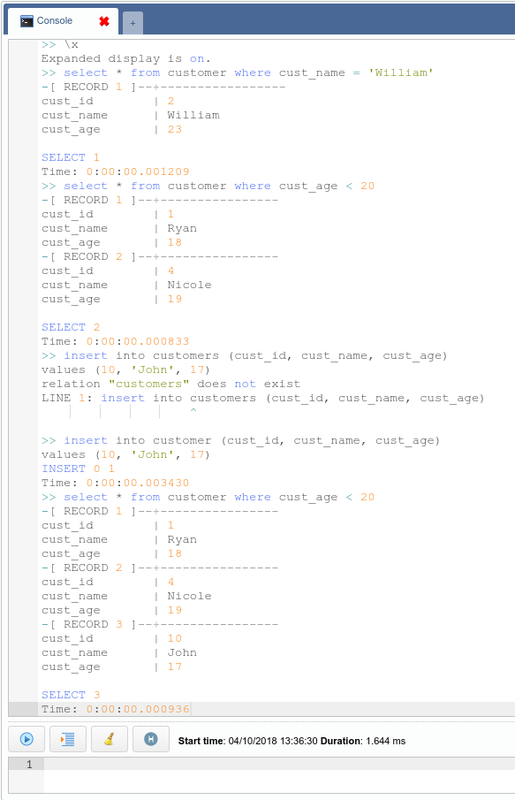 Backslash commands such as \dt, \d+, \x and \timing are very useful when dealing with databases every day. 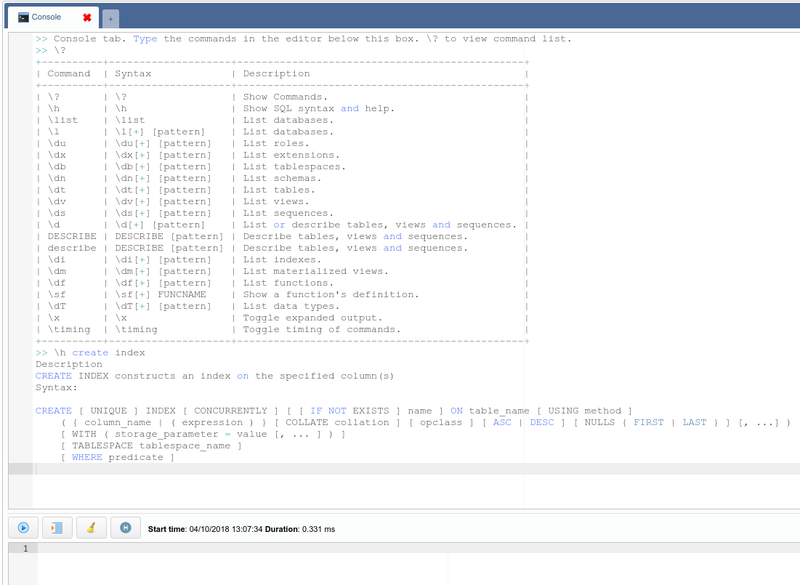 The console tab will also show any errors and the results of any SQL command you type in a pretty way. Try it out! In the near future we will add more commands such as \copy and also the ability for the user to create custom commands. Stay tuned!